If your 1999-2009 Mustang is missing it's A/C dust caps, get your replaced with these direct replacements! 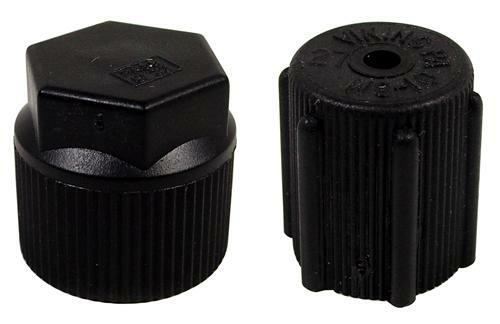 This Air Conditioner (A/C) Dust Cap Pair for 1999-2004 Mustang GT, V6, & Cobra, 2005-2009 GT & V6, & 2007-2009 GT500 includes OEM Motorcraft dust caps. Recommended replacement if damaged, lost, or when you replace your A/C hoses and components. These dust caps keep dirt and other particles out of your A/C service ports which, if penetrated, can cause A/C failure and who wants to be without A/C!? Be sure to grab these today if you're missing one or its cracked!